See the last test of Tilikum Crossing’s unique public art lighting! 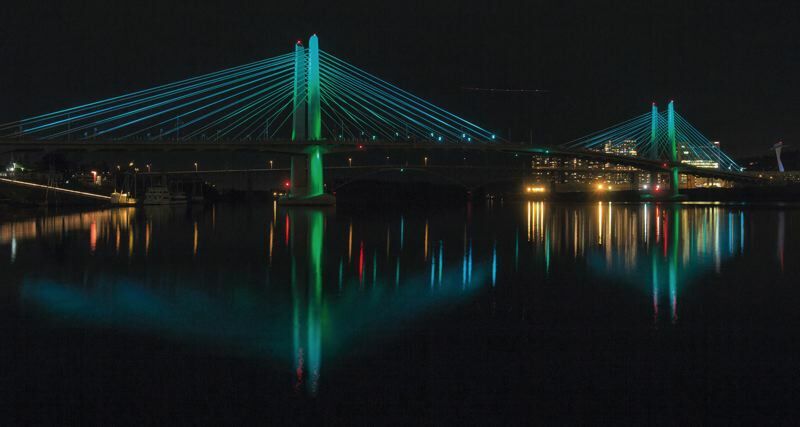 On Monday night, June 22, the public will be able to see the final testing of the aesthetic lights on Tilikum Crossing, Bridge of the People. The aesthetic lighting is part of the MAX Orange Line’s Public Art Program. The art feature translates in real time the natural conditions of the Willamette River into a beautiful display of lights. Starting after 9:30 p.m. on June 22, crews will test the computer program interface with the lights and the real-time data source from the U.S. Geological Survey (USGS) river monitor located near the Morrison Bridge. The lighting is directed at Tilikum Crossing’s 20 bridge cables, four tower pylons above and below the deck, and two landside abutments. After the test, the lights will be turned off until “First Light,” Sept. 10, two days before the Orange Line opens on Sept. 12, 2015. Starting after 9:30 p.m. tonight, the public can view the lights from both sides of the Willamette River, with easy access at SE Caruthers Plaza on the east bank of the river, or along SW Moody and Porter Avenue in the South Waterfront. The lighting system will change colors according to data streamed from the USGS river monitor. The lighting effects will change based on the river’s speed, height and water temperature. Artists Doug Hollis and the late Anna Valentina Murch created the aesthetic art feature. Lighting programmer Morgan Barnard designed the specialized software that reads the data from the river and translates it into the movement of color and light across the bridge. The base colors will be determined by the water temperature. The speed of the river controls the pace at which the colors change and move across the bridge. The height of the river controls the visual contrast in the pattern of color and lights. These river characteristics are a dynamic system, with large changes over the course of the seasons and smaller fluctuations that constantly occur throughout the day. LED lights are five times more energy efficient than conventional metal halide lights and last up to 16 times longer with far less degradation of lighting output.